Import product ratings from eKomi to your Lightspeed automatically and easily with our eKomi app. Just enter interface ID and password for your eKomi interface and you are all set! But wait, there is more! The app can also pass on the order information directly to eKomi if you want so that eKomi can send ratings emails on your behalf. You can even set the time after which those emails should be sent. Apart from that you don’t have to bother with anything. It couldn’t be easier! The app comes with a clearly designed no-nonsense interface, which allows you to turn ratings import and ratings emails on/off individually. Additionally, you may set the sender address and displayed sender name for the ratings emails. 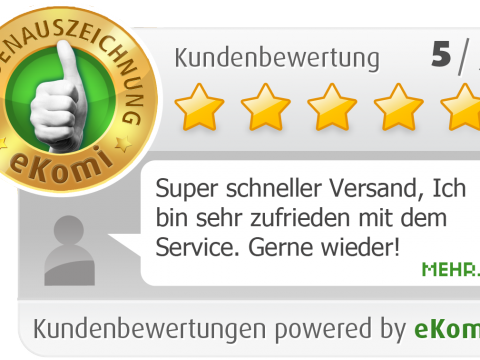 eKomi is a third party service provider for search engine optimised shop and product ratings. Customers can rate single products they have purchased and/or your shop as a whole. 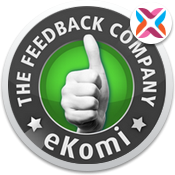 The complete rating process is managed by eKomi which adds trustworthiness to the ratings and comments. Additionally, eKomi offers Google AdWords star integration and rich-snippets. Our App automates the import of the ratings from your eKomi account to your Lightspeed and the export of the relevant order information to eKomi. With that information eKomi can write to your customers on your behalf to ask, whether they like to rate the products they have purchased and their shopping experience as a whole. You can set the number of days after those emails shall be sent (3, 7, 14, 28, 30, 60, 90), the sender email address and the displayed email sender name. You need an eKomi account prior to using this app (fees apply)! 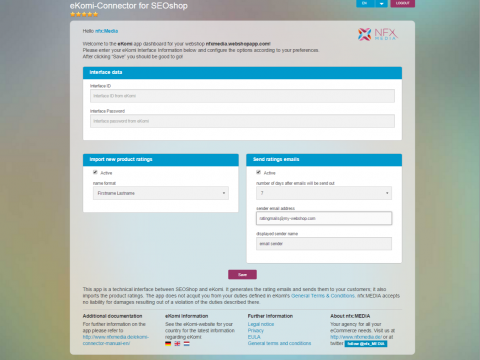 Please use our ticket system for serious and urgent issues: http://nfxmedia.de/ticket/. Thank you!